Savvy Rest SALE! 20% OFF select items! Savvy Baby Crib Mattress, Duvet Inserts (Wool Comforters), Sheet Sets, Allergy Encasements & Talalay Pillow. This SALE runs through March 4th and is a fantastic deal! Tell your friends! Our Natural Duvet Insert is made with premium natural wool sourced in the United States and covered in certified organic cotton sateen fabric. This a perfect option for those looking for domestic, quality materials. You can place it inside your favorite duvet cover or use it alone as a fluffy comforter. 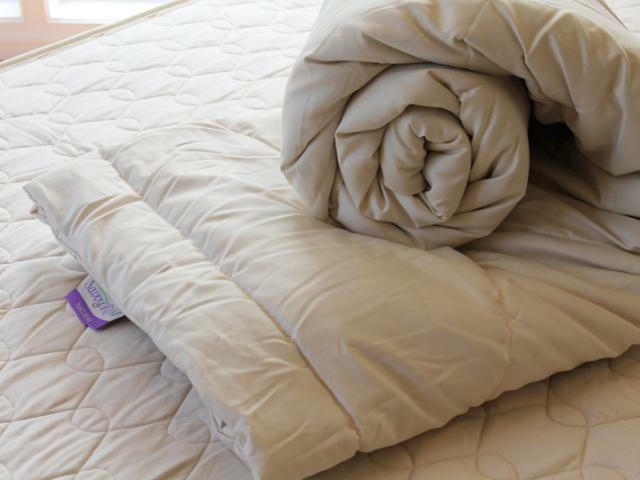 Our duvet insert is meant to drape over the side of your bed, completely covering you for a cozy night’s sleep. We love using wool because it promotes air circulation, leading to a comfortable sleep experience. You’ll feel warm and cozy in the winter but cool and refreshed in the summer. Whether you’re just starting to shop for natural products or have a natural home already, this duvet insert will compliment your bedroom beautifully all year round. Twin 68" x 86" Full/Queen 86" x 86" King/Cal King 100" x 90"